GALION — On Thursday, the bowling teams from Galion High School welcomed conference foe Harding to Victory Lanes to compete in their second-to-last Mid-Ohio Athletic Conference contest of the season. After already clinching at least a share of the conference title with the Presidents, a win would secure an outright MOAC title for the boys team. Galion would show up in a big way to do just that, defeating Harding by 241 pins; 2,442-2,201. With their 2,442 score, the Tigers not only cracked the 2,400 mark for the first time this season, but also broke their own school team scoring record. As a collective, four of the five bowlers representing the orange, blue and white recorded two-game series totals of more than 400 pins. Leading the way for Galion on the afternoon was Austin Rinehart, rolling games of 192 and 243 for a total of 435 pins. Just four pins behind Rinehart was Alan Evans, notching a 431-series with games of 222 and 209. Dylan Ruth posted a two-game score of 422 thanks to a first game score of 243 and a second game score of 179. Jacob Lear came in at exactly 400 pins, rolling games of 187 and 213. AJ Randolph rolled a 180 and a 185 to net a score of 365 for the Tigers in their conference title clinching efforts. After the first game of the match, Galion was ahead of Harding; 1,024-822. The Presidents attempted to cut into the Tigers lead but Galion was determined and outscored their guests 1,029-1,019 in game two to head into the Baker Series up; 2,053-1,841. In that two-game series, the home squad posted a 187 and a 202 to add the 389 necessary to crack the coveted, 2,400 pin score. Over on the girls side, it would be the Prexies rolling their way into victory, defeating the Lady Tigers; 1,758-1,464. Harding led after the first game; 677-561 and after game two; 1,457-1,219. In the Baker Series, the Prexies added 301 pins (56, 145) en route to the nearly 300-pin victory. Galion posted Bakers scores of 139 and 106. Abby Crager recorded the high series on the afternoon for the Lady Tigers, rolling a 130 and a 134, totalling 264 to edge teammate Halle Kiss. Kiss posted a 138 and a 125 to finish with a two-game series of 263. Shiyenne Current finished the day with a 247 (102, 145) and Maleah Stratton cracked the 200-series mark, posting a 212 (103, 109) for Galion. Shelena Wilcox rolled a 145 in game two while Paige Donahue racked up 88 pins in game one to round out the Lady Tigers scoring. Galion’s last home match at Victory Lanes will take place on Tuesday, January 29 when they play host to Crestline. GALION — Back on Tuesday, January 22, the Galion Tigers bowling squads hosted the visiting Mount Gilead Indians in non-conference play. The Galion boys remained undefeated on the season, routing the Indians; 2.274-1,524. Mount Gilead’s girls team edged the Lady Tigers by a final score of 1,385-1,328. Scores for the boys on Tuesday were: Evans- 206, 198=404; Ruth- 161, 242= 403; Lear- 201, 193= 394; Rinehart- 167, 214= 381 and Randolph- 159, 165= 324. Galion’s girls team scores against Mount Gilead were: Crager- 123, 115= 238; Current- 126, 104= 230; Kiss- 108, 112= 220; Donahue- 110, 84= 194; Stratton- 0, 133= 133 and Wilcox- 94, 0= 94. 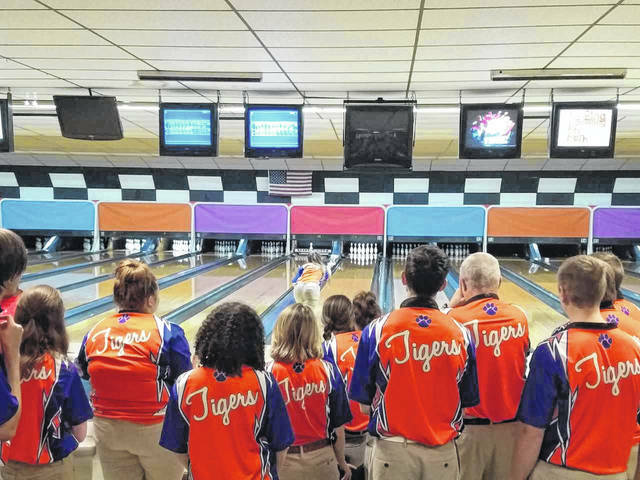 Chad Clinger | Galion Inquirer The Galion bowling squads show that they are each other’s biggest fans during Thursday’s match at Victory Lanes against the Harding Presidents. Galion’s boys squad cracked the 2,400-total pin mark en route to breaking their own school record and clinching the MOAC title outright. https://www.galioninquirer.com/wp-content/uploads/sites/38/2019/01/web1_teamwork.jpgChad Clinger | Galion Inquirer The Galion bowling squads show that they are each other’s biggest fans during Thursday’s match at Victory Lanes against the Harding Presidents. Galion’s boys squad cracked the 2,400-total pin mark en route to breaking their own school record and clinching the MOAC title outright.